In our Bible readings we have just heard three stark confessions: “Woe is me! I am lost, for I am a man of unclean lips, and I live among a people of unclean lips” (Isaiah 6:50; “Go away from me, Lord, for I am a sinful man!” (Luke 5:8); “I am the least of the apostles, unfit to be called an apostle”, (1 Corinthians 15:9). It’s one of the world’s most famous plays. It’s full of violence: battle, treachery, murder, lust for power. It includes the assassination of a king, and revenge; the ghost of one victim appears and terrifies the murderer. What’s more, running through it all, there’s witchcraft, spells, and scary incantations: “Double, double toil and trouble/Fire burn and cauldron bubble……..Eye of newt and toe of frog/Wool of bat and tongue of dog/For a charm of powerful trouble/Like a hell-broth boil and bubble.” It’s about a curse laid upon people. The play is Shakespeare’s–whoops, I wonder if I should give its name. There’s a superstition in the theatrical world that even mentioning the name of this play brings bad luck. Some say the play itself is cursed by the witches who feature in it. So actors call it “The Scottish Play” instead of its real name which–I’ll say it anyway–is …Macbeth. Macbeth is set in late mediaeval Scotland, and Shakespeare wrote it more than 400 years ago. But the play still has a haunting message for today: about how evil can come to infect a whole society through one person’s ambition. Macbeth murders the king, Duncan, and seizes the throne, and thereafter is trapped in guilt and misery, and drags so many others into his hell. He, and the whole of Scotland, seem under the curse pronounced by the witches. The question then is, how can the curse, the infection of evil, be lifted? But that poses a further question: can you get to grips with evil, without becoming mired in evil yourself? Can you clean up the mess, without yourself getting dirty in the process? If politics, as is often said, is a dirty business, who can go into it and retain a clear conscience? One of the key scenes in the play is when the main goody, the nobleman Macduff, confronts the murdered King’s son, Malcolm, and seeks to persuade him that it’s his duty to take the throne which is rightfully his and dispatch Macbeth. This not just for Malcolm’s own sake, but for Scotland’s sake since the country, languishing under Macbeth’s tyranny, is sinking into chaos. Malcolm is very reluctant. Why, he asks, should I be expected to be any less ambitious, lustful, greedy and violent than Macbeth, since I’m no angel, and as human as he is with all the human weaknesses that he has? Will Scotland be any better off under me than under Macbeth? Or, we could say, “Woe is me. I am a man of unclean lips, and I live among a people of unclean lips – and hands.” Macduff has his work cut out to make Malcolm see differently: Scotland needs him. But the evil injected into the country by Macbeth is so pernicious: the tyrant has demoralised Duncan’s son and heir, made him feel that he too is wicked, and so is paralysed into inaction. And Scotland is thereby doomed to suffer indefinitely. Macduff does succeed eventually in freeing Malcolm from his sense of doom and self-pity, and Malcolm realises what had happened to him: “Devilish Macbeth/By way of these trains hath sought to win me into his power.” Freed now from the spell Macbeth has cast over his soul, Malcolm is set to win back his father’s throne, and in turn to set Scotland free. 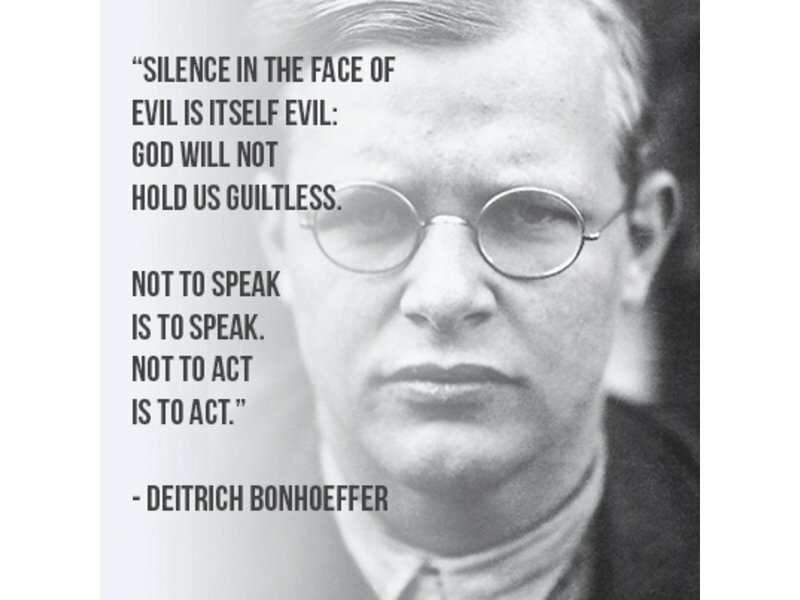 We have been silent witnesses of evil deeds. We have become cunning and learned the arts of [deliberately cloudy] and equivocal speech. Experience has rendered us suspicious of human beings, and often we have failed to speak to them a true and open word. Unbearable conflicts have worn us down. Are we still of any use? We will not need geniuses, cynics, people who have contempt for others, or cunning tacticians, but simple, uncomplicated, and honest human beings. Will our inner strength to resist what has been forced on us have remained strong enough, and our honesty with ourselves blunt enough, to find our way back to simplicity and honesty? 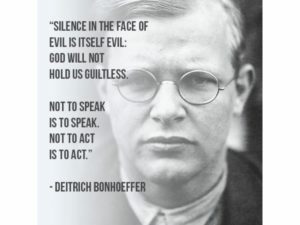 I’m sure some of us here, in a very different time and place, similarly know even a bit of the cost of opposing what we believe passionately to be wrong. Which of us has not experienced “intolerable conflicts which have worn us down”? Which of us has never come home from a meeting, perhaps even from church, tired and dispirited and angry, because people have put their quarrels with one another above their calling to act as one, to be at peace with one another other and to bring God’s peace to the world? So we exclaim, “I’d like to bang their heads together!” Which of us, engaged in campaigns for justice and equality–for the rights of the disadvantaged and for freedom for the oppressed, or for the safeguarding of creation– and disillusioned by the evident failure of the powers that be to act or in any to respond to our demands, has not ended up in a glow of smarting self-righteousness? That self-righteousness then morphs into an arrogance as great as we see in any government or official in high places. What we oppose still casts its own spell over us. We are trapped under the same curse. this people I have loved. Love. It is the love of Christ that dis-spells the power of what we oppose, which insinuates its dark power into our hearts. That is what the Psalmist knows when he says “Though I walk in the midst of trouble, you preserve my life against the wrath of my enemies” – the wrath which threatens to destroy my soul from within, the enmity of those who hate me, by making me feel the same way about them. It is with the love of Christ taking charge of us, that we can venture into combat with the wrongs of our time without being dragged down by the very same demons that we oppose. How do we allow that love to take hold of us and free us from the spell? There is no magic formula to recite, no incantation to counter the curses of the witches, nor any glib programme to follow in the latest paperback manual on how to live successfully. We must come to that moment of truth, the truth about ourselves; the truth that in ourselves we are indeed of no use, but knowing that what we think of as our uselessness is an emptiness which the love divine, all, loves excelling, is longing to fill, and through us to spill over into the world around us. God has a use for us, regardless of how useful or useless we think we are for God. Holding on to that, letting God love us and love through us, is faith. That is what our worship is about. Here we stand where Isaiah stood, in the temple where earth and heaven meet, where even as he sees the unspeakable vision of a heavenly glory filling the entire earth, and says, “Woe is me, I am lost!” he feels upon his unclean lips the searing touch of holy love – it tastes like bread and wine – and his sin and guilt matter no more. God has taken care of that. All that matters now is that he is –that we are– called by God, and will be sent by God. We take the road to Damascus, and stand with the know-all extremist Pharisee, the person unfit to be called an apostle. Blinded by the same light that awed Isaiah, we hear the voice of the risen One we have been persecuting in our ignorance. With the unfit apostle, we can start all over again, to be filled and compelled by the love of Christ for all people. 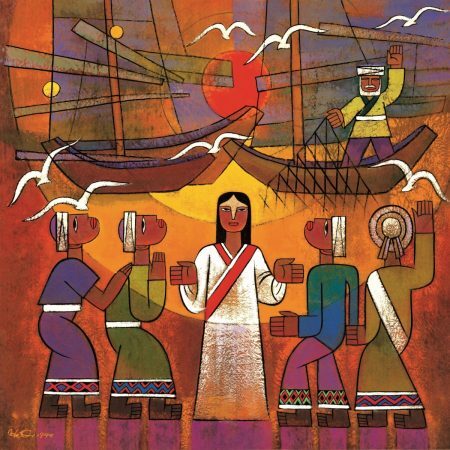 We stand in a boat that has toiled all night to no effect and feeling useless, that all our work is futile, hear a voice saying, “Put out into the deep water”; and soon, amazed at what has happened, knowing that we are in the presence of the Holy One, we say, “Go way from me, Lord, for I am a sinful mortal”. But we hear a second command: “Don’t be afraid”. We shall be agents of God’s adventurous love in ways we cannot yet imagine. By grace, we are of use.